Address : 35 Jalan Bukit Bintang, 55100 Kuala Lumpur, Malaysia. Whether you are on a business trip or vacation getaway, this hotel provides warm hospitality to ensure your stay is as comfortable as possible. 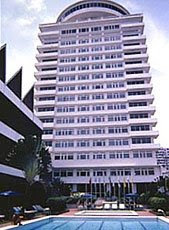 The Federal is a landmark hotel built in 1957 for the Independence celebration of Malaya. The hotel is located along Jalan Bukit Bintang, right in the centre of the metropolis. Within walking distance of major business, shopping and entertainment centres. The hotel features 350 well-equipped guestrooms. All rooms are furnished with eco-friendly toiletries, organic Personal Bar, recycle laundry bag, natural Pandan leaf fragrance and Eco Breakfast. A cosy restaurant for casual dining serving a la carte buffet, overlooks the Federal's tropical garden and swimming pool. Savour fine cuisine in Malaysia's first revolving restaurant that offers western cuisine with an impressive 360-degree view of KL City's skyline and superb viewing of colourful fireworks on New Year's Eve. A ballroom and a banquet hall with a series of meetings and function spaces accommodating up to 800 people are also available here. All function rooms are equipped with high-speed internet access.